In the last 5 to 8 years I have definitely noticed huge changes in the food and bar menus being served at weddings. Most people start “feasting with their eyes” first, which means presentation of the food and drink has become extremely important. It is why even after 27+ years of planning I subscribe to most catering, liquor, wine and gourmet food magazines, attend every Restaurant and Fancy food show and consistently check many of the 100 best restaurants in USA web sites every year. Self-education remains vital in this industry. Let’s start from the beginning – Bar. I always had requests from my Brides and Grooms to have particular brands of liquor served at the bar during receptions but today it goes even further with many requesting specialty drinks and set ups. It could be an Ice Luge with attendant pouring 2-5 different colors of Martini’s or preset Martini and Mojito (pronounced Mo-hi-to) stations. If you have a cocktail hour with different stations and have a budget for it, do incorporate a Martini station. It looks fabulous, colorful and guests will enjoy the view as well. 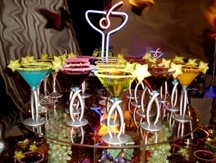 Ask bartenders to use a garnish and flavored rimmers of Martinis (rimmed edge of the Martini glass): five colors of Martinis (picture above) was requested by one of my Brides and major ingredients were: Blue (Hypnotic Liqueur), red (POM), brown (chocolate or coffee flavor), Green (apple) and Orange (Mango). It did look wonderful and held attention of the guests (ladies mostly) for quite a while! With many guests with different tastes it pays to keep your choices to neutral and popular selections. Cocktail hour: food stations with attending chefs are another great idea. The most popular stations are seafood, carved meat, sushi and Ethnic stations, such as Chinese, Thai, etc. My favorite is a sushi station. It is very colorful, light and loved by most, since it has different seafoods: raw and cooked. Pictured, this one is elaborate with specialized decorations for a sushi station but could be done just as good on any plates or trays. Recently I have done a Breast Cancer New Year Charity Emerald Dream Ball Event in Rio Hotel, Las Vegas, which was attended by celebrities including Allison Sweeney, Melissa Gilbert, Ian Ziering to name a few, where sushi were served from fully painted bodies of male and female models. That was a nice touch and my client was complemented on the choice! You can believe our guests will remember that sushi’ selection! Even passed hors d’oeuvres can be fabulously presented on the trays or large glass – plates. Example: Tuna tartar in an individual eatable cone with stainless steel stand on the bed of black seeds or nut crusted cheese lollypops with roses and glass marbles (Michael Goodman, Executive Chef of Four Seasons in Las Vegas recently did both). You can also add something special, eye catching and fabulous, such as an Amuse Bouche (Amuse is from the French amuse-bouche or amuse-geule and is a small teaser -pre-meal appetizer). I am a firm believer in creating a special touch in every aspect of the Wedding, especially at the beginning, when your guests walk in and sit down, Let them notice something different-the “Wow” factor as I call it… Later on they will remember the overall effect- whether they did have fun and enjoyed the Wedding or not, But I guarantee you they will remember the first impression : So in my opinion, in the beginning is important to focus their attention on a single detail only, and since they sit at the table – consider presetting or serving fabulously presented starter – Amuse Bouche. 2 pictures bellow is an example of Amuse : each plate was set up with a different color eatable flowers on the bottom of upside down Martini glass as well as on a top of thinly cut roasted toast of white bread with bite size appetizer, topped with a black caviar. 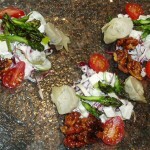 Credit to by Executive Chef of Palmer House Chicago Hilton Steven Henry. 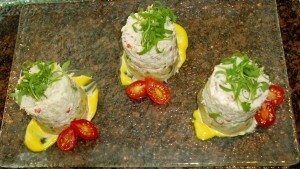 Tomato and mozzarella Napoleon, as well as black and white sesame seared tuna. You do not need a huge amount of food but is you are going for an option of 5 hour bar -you will need a bit more food then when you plan for a 4 hour bar. Drinking without food is not a great idea. Salad served could be substantial as those mentioned above or very light and all vegetarian such as for example : 7 organic greens, poached pears, dry cranberries, roasted pine nuts and light balsamic vinegar or Cesar salad with herb croutons and shaved parmesan. Now, sorbet is also could be a beautiful presentation, Michael Goodman, Executive Chef of Four Seasons in Las Vegas, Nevada uses every detail to accent food. Even sorbet looks appetizing. On that platter bellow: a napkin is used for the presentation as well to accent delicate orange color of sorbet. A mint leaf, rose petals and blackberry make it special.. If there are no dietary or religious restrictions, I would definitely suggest serving a combination of the main entree, such as petite file or chicken with a petite serving of fish or shrimp. Petite means 4-5 oz. as compared to a regular portion of 6-8 oz raw product. This approach reduces the potential mistake by staff serving food and the other offers your guests better choices and less time spent at the table and more dancing. Main entrée accompaniments – choose the starch and vegetables carefully, just because you like certain flavors – your guests will. Most popular and neutral choices in 2007-2008 are either garlic mashed potatoes or roasted Yukon or red potato quarters or going a little pricier choice- white fingerling potatoes. 80-90% love asparagus – great vegetable choice, but I would ask the chef to add something of a color to it, could be a yellow squash ring or grilled red or yellow pepper strips. Meat and fish have different sauces so keep in mind if you are choosing the Combination course, to have different colors of complimenting sauces on both. 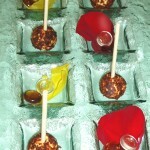 It will also add contract to the presentation as well as a different flavor. Truffle or cognac sauces are light, flavorful and very much loved by many. It is a great alternative to heavier wine reduction or butter sauces. Dessert: most guests will not leave till they have one. An individually served platter is more popular choice of 2007-2008. As a Special touch- have your initials or monogram drawn on the platter. 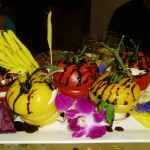 Consider a mini trio deserts on a bed of different color sauce or coolies( lighter fruit sauces). For example, flowerless chocolate cake slice, fruit tart with custard or light mousse, strawberry dipped in chocolate -and you sure to have something for everyone’s taste. 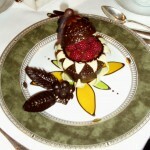 A bit higher end is this, Chocolate Faberge egg with chocolate mousse and fresh raspberries on a very beautifully decorated plate with colorful sauces and chocolate leafs, courtesy of Executive Pastry Chef of Four Seasons Hotel, Jean Luc in Las Vegas. Another approach is individual mini pastries and Strawberry coolies shot with white chocolate cigarette created by Chicago Peninsula Pastry Chef. If you are considering a sweet table, you can ask for a focal Grand piece, if your budget allows it. 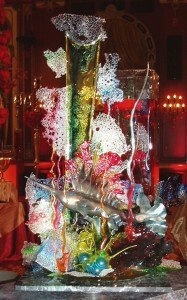 Consider decorating the sweet table as well, for example this incredible, eatable work of spun sugar by the Executive Pastry Chef from Palmer Hilton hotel. I sincerely hope that some of my suggestions will help you to choose your menu for your Wedding!